A long time ago in Middle Earth, a wizard named Gandalf the Grey took the hobbit Bilbo Baggins on an adventure. The classic tale, The Hobbit, by J. R. R. Tolkien, was a children's tale inspired by European fairy tales and legends and informed by Tolkien's own fascinations with myth and language. The story is essentially a journey by a group of adventurers who seek to regain control of their home, which was stolen by a gold-hungry dragon. 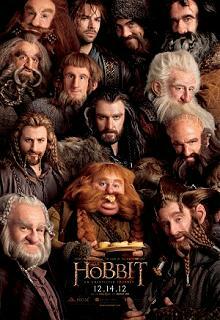 The story of The Hobbit, and the Lord of the Rings, are well-known in fantasy circles. They are essentially fantastic boys-own adventures and in this imagining the emphasis is on clever special effects to create the characters and lots and lots of fighting. Like the Lord of the Rings trilogy, the story is being drawn out, with lots of playing with character sizes interspersed with sweeping views and mood music. Very much written for the fans, this screenplay, despite being written by women retains some of the worst of the original's misogyny, especially the use of the word "Man" to mean "Human" -- a repeated spit in the eye to women of a kind that would not be permitted or tried when writing characters of non-white persuasions. Another one for the boys.